Posted on October 2, 2015 by EllenAllen	in Planning to write and tagged 100 word story, Emma Cline, How to write a book, How to write a novella, How to write short stories, How to..., MacGuffin, Marion, Michelle Ule, Shirley Jackson, Stephen King, The Lottery, Writing a book, Writing advice. Read short stories – Obvious really, but you need to be reading what you’re trying to write. There are some great shorts on americanliterature.com (by Stephen Crane here, by Guy de Maupassant here and another by Edith Wharton here). For a more modern flavour, try my favourites – The Lottery by Shirley Jackson, The Shawshank Redemption by Stephen King and Marion by Emma Cline. Plus, The Guardian recently ran Jonathan Tel’s winning entry in the Commonwealth Short Story Prize. 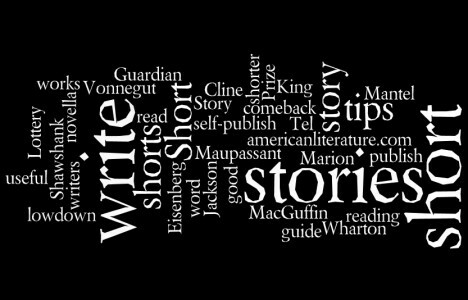 Take tips from other short story writers – Watch Kurt Vonnegut give his 8 tips on writing good short stories here (“start as close to the end as possible”) and read Michelle Ule’s piece about how to write a novella in 5 steps on the Books and Such blog (she pretty much gives the same advice as for writing longer stories but it’s useful nonetheless). Publish – There’s a real buzz around the new platform, MacGuffin, which is the place to self-publish shorter works or for the really short, you could use 100 word story. There you have it. Easy as one, two, three. There’s a new book out by Philip Hensher that documents how the short story has been at the heart of British writing for centuries, giving established writers an opportunity and disenfranchised writers a voice: http://www.theguardian.com/books/2015/nov/06/british-short-story-philip-hensher-anthology.